I can’t really explain why but I love a low ceiling. Estate agents, chief harbingers of the underworld as they are better known, would have us believe that high ceilings are better but as ever they’re lying. A low ceiling makes me feel cosy, safe and comfortable the way I imagine Bilbo feels in his hobbit hole when he’s not stabbing orcs or plundering other peoples magic rings. If you’re of the same mind and like that kind of thing then this is certainly a pub for you. If you are however freakishly tall then you might want to go elsewhere, or stand outside, or wear a helmet. Spread across a few levels this is one of those pubs where finding a seat is a potentially perilous exercise at busy periods. Engineering the perfect angle to simultaneously wiggle your arse past a strangers head whilst avoiding spilling precious beer upon the stranger you are now closer to than you ought to be makes it like some sort of beer based Krypton Factor. I like it. If you’re lucky you’ll get a perch at one of the few tables smattered around or even better find yourself tucked into a tidy little booth. A relaxed atmosphere permeates here and the staff were exceptionally friendly. Upon hearing the unpublishable and more disgusting topic of our conversation rather than call the police they joined in and we all had a ruddy good laugh. These staff are not only able to banter with the best of them but also have the option to serve up a few choice ales, perfect to calm you down after a hard day weaving in and out of pavement cloggers in central London. 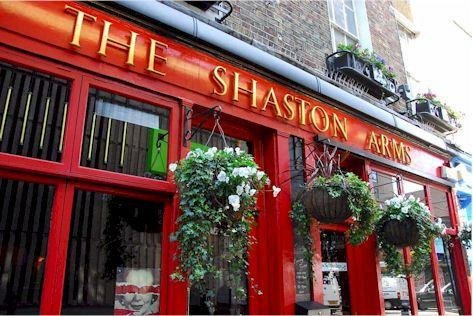 The Shaston Arms is a solid offering of a pub. It’s classic. Its stone floors and wooden booths are what a pub should be and the simple decor doesn’t try to hard. I think however the thing that tips this from being average to great is that on rare sunny days in old blighty there’s a seating area out the front so you can sup your pint and breathe in what passes for clean air these days.